With the start of a new school year, the Pregnant Scholar team is happy to launch this first in a series of Pregnant Scholar Profiles! Every month we’ll share insight from a student parent who stayed on the path to achieving their educational goals. Click here to nominate a current or recent student parent for our profiles. 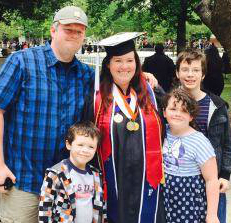 Our inaugural interview is of Dianna Blake, a mom of three and graduate student at Cal State Fullerton who spends much of her free time working to support other “non-traditional” students. When did you have your children? What did you expect it would be like to have kids in college? With my first, I had just started community college at 21, but I dropped out. When I went back to school again, my eldest was 5 and my second child was just 6 months old. I didn’t know what to expect, for a long time I didn’t feel I had the right to be in college simply because I thought my goals and dreams had to be put on hold. I also expected to be the only mom. Why did you drop out? And what prompted you to come back when your second child was 6 months old? I decided to drop out because I was embarrassed and ashamed, and felt as though I would face judgement at every turn. Part of this insecurity was based on the reaction that some had to my pregnancy, the other part was me judging myself too harshly. I didn’t think college was the place for a pregnant woman — boy has that changed! Additionally, I chose to return to school because it was something I considered again after realizing I hated working in retail and wanted to improve myself. What did you find the most surprising in your first semester as a student mom? What was the biggest challenge? The most surprising thing in my first full-time semester was that there were other moms attending, you just had to look. Also, I felt guilt for being away because I found myself enjoying class and I had it in my mind that it wasn’t OK for me to do something I enjoyed when I could be home with my kids. My biggest challenge was gaining confidence. My second biggest challenge was math! How did your university support your continued studies when you had children? Did you know about your Title IX rights? On an individual level, I had professors who, once they knew my story, reached out to offer support, sometimes giving extended deadlines and other times simply checking in with me to see how I was. One professor requested everyone turn off their phones, except the students with children. I thought that was wonderful. However, my rights under Title IX were best met during my (unexpected) pregnancy during my final undergraduate semester. All of my professors worked with me so that I could finish my degree remotely (due to 20 weeks of vomiting, and 3 months of bed rest for Placenta Previa!) I found out about Title IX long before that, when researching the rights of students. However, the Adult Re-entry center director educated me further. These rights were helpful once again when I had a cesarean during the first week of my undergraduate semester. Each of my professors allowed me to work from home, and recorded lectures for me until I could return. Why did you start the Non-Traditional Students Network? I started the NTSN because, after talking to many Nontrads, I realized just how lonely the college journey can be for those who are parents, older, working full-time, veterans, etc. I wanted to create a forum-based community where students working in online programs or simply feeling isolated and alone, could come and chat with others just like themselves. It’s still in the birth stage, but I am hopeful it will catch fire and really become a resource for nontraditional students! What advice would you give to other student moms reading this? Don’t give up, even if you have to take a break. And if you take a break that doesn’t mean you have failed. Also, be willing to advocate for yourself by knowing your rights (like Title IX) as a student. Your presence in the college community adds value to the experience for you, other students, and staff, so don’t believe it when you start thinking you don’t belong. What advice would you give to professors or administrators looking to support student parents? You don’t have to go easy on us, but if you know the laws that protect us, inform us of them because we probably don’t know or we don’t want to impose upon you. Reach out to us. E-mail back. Respect our journey. Believe in us and we will begin to believe in ourselves. Oh, and ask us how our children are doing! Dianna Blake is a graduate student at Cal State Fullerton and will graduate in 2017. Dianna recently launched the Non-Traditional Students Network, an initiative to connect student parents and other non-traditional students with one another. She has also written a book about her journey, College Success for Moms: A Guide to Succeeding in College While Raising a Family due to be released later this year.